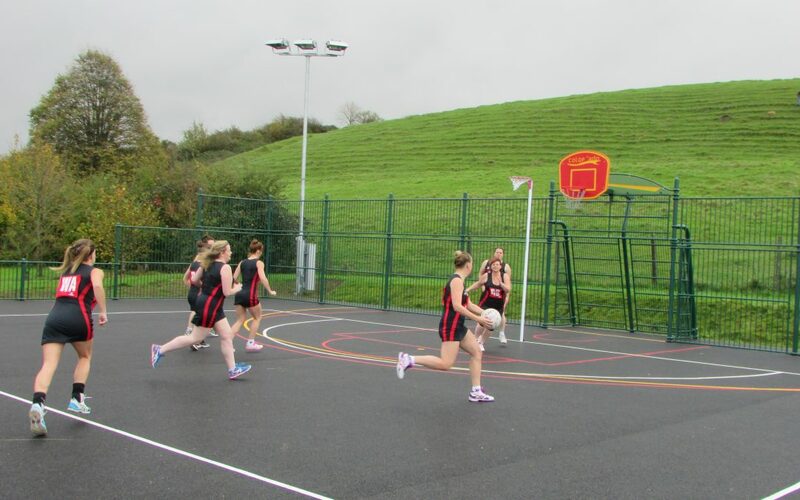 Members of the Town Council attended Bruton Robins’ first netball match on the new Multi-use Games Area this morning. 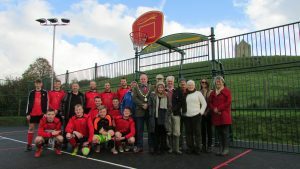 Later on Bruton United FC’s first senior team joined councillors to mark the opening. The MUGA is the first part of the Town Council’s proposals to improve the facilities at Jubilee Park. The MUGA is a free all-weather pitch for netball, basketball and five-a-side football, and can be floodlit. It was paid for from a mix of sources including money set aside by housing developers, South Somerset District Council, the Town Council and a Bruton Community Partnership fundraising event. Other proposals, which are part of Bruton’s new Town Plan 2017, include a new skate park (the “Bru Bowl”), upgrades to the lower pitch and the play area, and rebuilding of the pavilion. Plans for these further developments are at an outline stage, and will go ahead once funding has been secured.